Welcome to The Grand Hotel Myeongdong, newly opened in 2013. 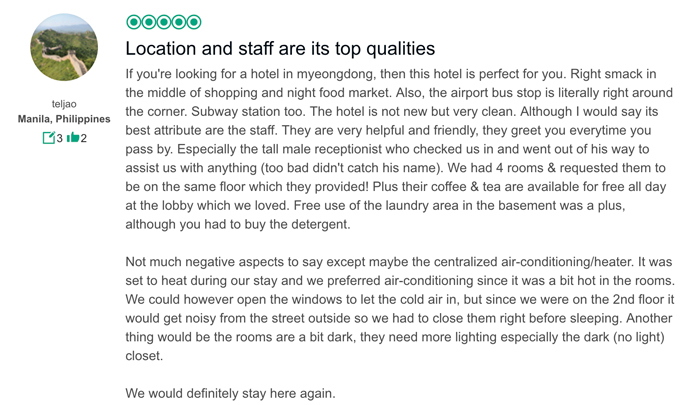 We are ideally located in the heart of Myeongdong, the most thriving business and shopping area of Seoul. Our corporation also operates both the Incheon Grand Country Club and the Grand Convention Center. We do our best to give our guests positive experiences and service they can trust. We hope your time in Seoul provides many wonderful memories, and we hope The Grand Hotel Myeongdong can be part of them. There are 8 types of rooms with a variety of interior concepts all of which are furnished with the best amenities for customers’ comfortable stay. All employees offer the best service, so customers may enjoy comfortable rest and deal with their businesses effectively. · Contact Us © The Grand Hotel Co., Ltd.